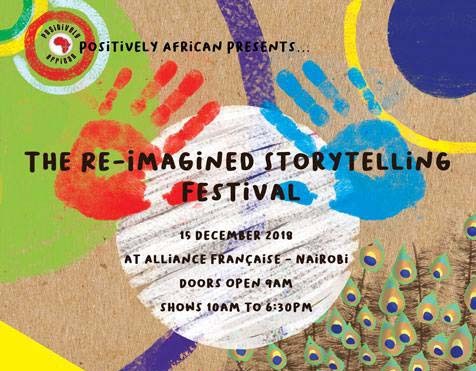 The Re-Imagined Storytelling Festival 2018 will be hosted at the Alliance Française, Nairobi on December 15, 2018. In 2017 Positively African, a Nairobi based organization bringing together a Pan-African network of artists, activists and academics unveiled the Re-Imagined Storytelling Festival. The festival drew on age-old African traditions of oral storytelling in order to revive the art, re-imagine African folktales and nurture a reading culture. That inaugural edition featured June Gachui reimagining Maid in SA by Zukiswa Wanner, Neno Kali reimagining Can We Talk by Shimmer Chinodya, and Maimouna Jallow bringing to life The Secret Lives of Baba Segi’s Wives by Lola Shoneyin. The second edition of the festival will return with performances by storytellers from Kenya, South Africa, Sierra Leone, Morocco and Australia. They are Jawad Elbeid and Adil Lemghari Idrissi (Morocco), Muthoni Garland, Chomba Njeru, Wangui Wa Kamonji, Leonidah Nanjala, Ernest Wambugu and Wangari The Storyteller (Kenya), Nomsa Mdlalose (South Africa), Usifu Jalloh and Alim Kamara (Sierra Leone), and Lillian Rodrigues-Pang (Australia). The evening will be the first times audiences will see Story Story, Story Come an illustrated anthology of 12 re-imagined folktales by authors from across Africa and the Diaspora including an audio book version to original music. The children’s book is published in West Africa by Ouida Books and in East and Southern Africa by Paivapo. The Festival will also premiere the production The Door of (No) Return, an adaptation of some of the stories, in partnership with ZamaleoAct. Here is the program in full. Tales from Morocco with Jawad Elbeid and Adil Lemghari Idrissi, Kenyan storytellers Chomba Njeru and Leonidah Nanjala. Prepared from my ancestors pot with Nomsa Mdlalose (South Africa), Hip Bop Aussie Story by Lillian Rodrigues-Pang (Australia); interactive show: The Magic of puppets. The griot and the rapper with Usifu Jalloh and Alim Kamara (Sierra Leone); Living memories with Muthoni Garland. Panel Discussion: Folktales of the future with Mshai Mwangola, Ayuma Michelle, Gugulethu Radebe, and Muthoni Garland; Interactive workshop with Shekere Dance & Stories by Wangui Wa Kamonji. Meet the authors of Come Come, Story Come. The Door of No Return Premier with Maimouna Jallow, John Titi, Sanjali Jobarteh, and Patrick Gachie. Official launch of Story Story, Story Come. Feel the beat – Story jam session featuring all teller. Music by Sanjali Jobarteh, Usifu Jallow, and Patrick Gachie. Reading nook – a quiet place to read and listen to stories being told; listening booth – sit back, relax, and listen to reimagined African folktales from the newly released Story Story, Story Come.